▷ Vegas Pro 16 - Review - Awesome video editing software? Vegas Pro 16 is a great video editing software which lets you get the most out of your videos. I’m using the previous version and I’m absolutely enthusiastic about it. The video editing program is mainly aimed at professional users or advanced hobby filmmakers. With Vegas Pro, there’s definitely no limit to what you can do. The Edit version is sufficient for me. To create DVDs and Blurays you have to choose the normal version. The New Vegas Pro 16! Another year has passed since Magix released Vegas Pro 15. Now it’s time again. I edit my own videos with Vegas Pro 15 Edit and am an absolute fan of the program. In this test review you will find out whether it is worth buying this expensive program and which new functions are added. On the surface not much has changed compared to the older version. With dockable windows and saveable layouts, you can design the interface as you want it. The most exciting changes concern the functions of the program. The motion tracking tool captures motion in the video. This makes it easy to apply special effects such as masks and filters. For example, the program detects the movement of a person. If you want to pixelate the face, select this area in the video and select the appropriate mask. This saves a lot of time, because you only have to mark the area in which the moving object is located once. You can find a video of this function here. To improve the workflow, Magix now has introduced a dynamic interaction between storyboard and timeline. As soon as you change something in the Timeline, it will also be displayed in the Storyboard and vice versa. You can also add as many storyboards as you want to experiment with edits on individual scenes or as a help to organize the movie. Yes, even in Vegas Pro 15 there was already an image stabilization. 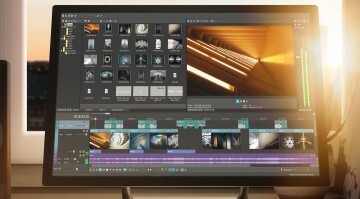 Magix announces to have rebuilt the new function from scratch. This makes it easy and fast to stabilize blurred or hand-filmed shots. But there is no big difference to the old image stabilization. Because of the new HDR support, colors can now be displayed even more beautiful with an appropriate camera and screen. There are a few more minor changes. You will find all listed here. As always, Vegas Pro is available in three different versions. Vegas Pro 16 Edit costs 399€ and contains the highlights described above as well as all other standard features. However, are the better programs worth the much higher price? The normal Vegas Pro also includes the Boris FX Continuum Lights Unit plugin, which lets you easily create awesome lighting effects to give your movies the Hollywood look. There is also the VitaScene effect package with 100 professional additional effects. Vegas DVD Architect: With the Vegas DVD Architect you can easily create menu-driven DVDs and Blurays. Unfortunately, this is only available from the normal Vegas Pro version. The DVD Architect can also be purchased separately as a single program from Magix. The Suite version costs 800€ and contains several professional effect packages made in Hollywood. I didn’t test the suite and therefore I can’t go into detail further. However, this high-end program is only worthwhile as a true professional who really uses all these effects. Vegas Pro is one of the best and most professional video editing programs on the market and Magix has done a great job with the latest version. 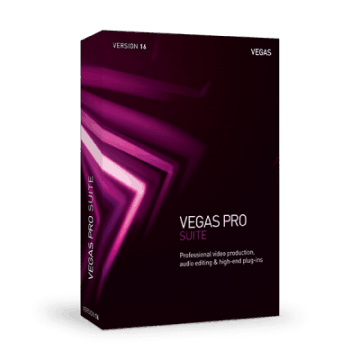 If you really love video editing and if you want to take your videos to a new level, you will be thrilled by Vegas Pro. I’m currently still using the 15er version and I will probably stay with it for a long time, because an upgrade also is quite expensive although its much less than buying a new software. If you have no experience with video editing I would recommend a simpler and cheaper program like Video Deluxe. But if you’ve edited a lot of videos and want to make video editing more professional, I can only recommend Vegas Pro 16.